Throughout his storied career, legendary director Akira Kurosawa has shared numerous, indelible tales with audiences around the world -- including epic samurai adventures, engaging crime stories, and deeply moving dramas about the human condition. But in one of his final movies, the filmmaker completely leaves these traditional modes of narrative behind in order to share something even more personal and elusive: his dreams. Taking viewers on a magical journey through visions both wondrous and frightening, the movie offers an intimate peek into Kurosawa's unbridled imagination, using cinematic expression to give form to joyful fantasy and haunting reverie. Structured as eight individual episodes, the runtime offers a series of vignettes inspired by the director's dreams and elements of Japanese folklore. Though these separate installments are not explicitly linked, they all feature the same traveling male protagonist, "I," played by Akira Terao as an adult, Mitsunori Isaki as an adolescent, and Toshihiko Nakano as a little boy. As we watch "I" journey through each fantastical story, Kurosawa gradually weaves an eclectic group of tales, covering a clandestine fox wedding, an icy mountain excursion, a meeting with Vincent Van Gough, a nuclear apocalypse, and more, offering an affecting mixture of fantasy and nightmare. Evoking the more abstract rhythms of a dream, each vignette is really more of a tone piece or simple allegory than a full-fledged narrative, resulting in a heavy focus on mood, imagery, and theme rather than a fully developed plot. But as basic as the episodes can be, they still provide satisfying and at times quite stirring experiences, often examining recurring motifs related to nature, art, and war. Likewise, Kurosawa clearly injects elements of his own life and childhood into the proceedings, along with a healthy dose of Japanese mythology. And though some of these more culturally specific elements might be lost to international audiences, the underlying emotions and imagery behind each piece prove to be universal. Man's relationship with the natural world and the horrors of nuclear destruction are particularly prominent themes. To this end, one vignette features a terrifying power plant meltdown and another finds our protagonist traversing a post-apocalyptic landscape populated by mutated "demons." Likewise, even the more light-hearted segments offer a strong environmentalist message, including an early episode where a young "I" feels sorrow over the loss of his family's peach blossom orchard, and the closing vignette which focuses on a peaceful village that rejects modernity. But while these moral and existential quandaries are fairly effective on their own, it's really the film's exquisite imagery that leaves the most lasting impression, breathing lyrical beauty into Kurosawa's delicate parable. Leaving the waking world behind, the film's aesthetic fully embraces the colorful majesty and dreary horror of dream and nightmare, creating gorgeous visuals that transition from painterly beauty to haunting darkness. The final shot of the opening segment is especially striking, featuring a breathtaking shot of a young "I" setting out on a journey among a sea of flowers under the vibrant arch of a rainbow overhead. Similarly powerful imagery litters the runtime, filling the screen with cascading blossoms, frenzied snowflakes, ghostly armies and, in perhaps the movie's most visually arresting sequence, the swirling brush strokes of Vincent Van Gough (played surprisingly well by Martin Scorsese). Ironically, however, as gorgeous as this Van Gough segment is, the episode also can't help but reveal some of the film's unfortunate flaws. Since certain special effects techniques have not aged particularly well, elements that may have once been groundbreaking are now rather rough. This leads to a few shots throughout isolated vignettes where outdated compositing, chroma key work, and filtering end up sticking out like a sore thumb. Thankfully, these instances are not the norm, and given the movie's age, they're perfectly acceptable (and expected). Likewise, even outside of the film's more overtly fantastical images, Kurosawa's masterful sense of cinematic style and staging always enhances the experience, often using wide framing to allow each dream to play out before the audience like some kind of phantom theater production secretly caught on film. Entrenched in the wistful melancholy of half remembered musings and fleeting visions, 'Akira Kurosawa's Dreams' is a beautiful piece of magical realism. Joyous and somber all at once, the movie finds powerful emotion within its sumptuous images and simple parables, presenting audiences with a dazzling window into the hopes, fears, memories, and abstract reflections of one of cinema's greatest directors. 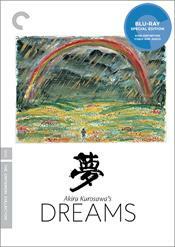 Criterion presents 'Akira Kurosawa's Dreams' on Blu-ray in their standard clear keepcase with spine number 842. The BD-50 Region A disc comes packaged with a pamphlet featuring an essay by critic Bilge Ebiri, and the director's script for a never-filmed ninth dream with an introduction by Nogami. The movie is provided with a 1080p/AVC MPEG-4 transfer in the 1.85:1 aspect ratio. Filled with gorgeous visuals that transition between colorful fantasies and dreary nightmares, the film features a mostly spectacular video presentation. Culled from a new restored 4K digital transfer of the original 35mm camera negative, the source is in fantastic condition with a light to moderate layer of natural grain, giving the picture a pleasingly filmic appearance. Clarity is strong throughout, with a great sense of detail, bringing all of the film's imaginative imagery to life. 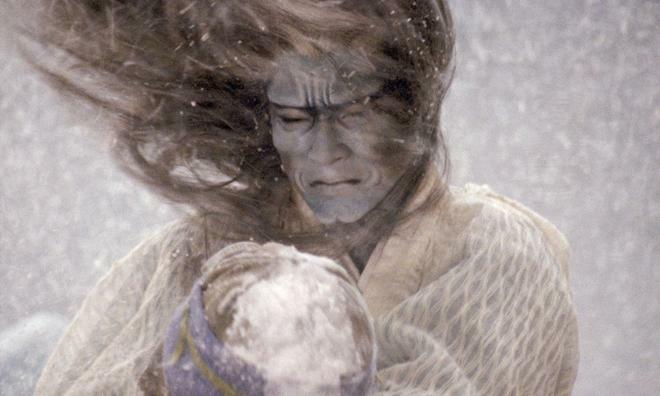 Individual flakes of snow, blades of grass, falling raindrops, and fluttering petals are all easily visible on screen with impressive fine texture and depth, both in occasional close-ups and throughout Kurosawa's frequent use of wide shots. Colors are especially striking, with a bold and sumptuous palette of rich hues, taking viewers through vivid fields of flowers, misty forests, and even into the painted world of Vincent Van Gough. Contrast is well balanced with even whites and deep blacks that avoid any sense of blooming or crushing. With all that, as beautiful as much of the transfer and cinematography are, not every vignette is as impressive looking as others. To this end, there are a few shots here and there that look comparatively rough with a softer, grainier, and flatter appearance. These instances usually involve effects heavy scenes and the lower grade look is likely a result of compositing and other post-production techniques. Outside of these inherent inconsistencies, I also detected some very minor banding during fades. Authentic to the source and marked by some stirring images, 'Akira Kurosawa's Dreams' comes to Blu-ray with an often spectacular transfer. The film is presented with a Japanese DTS-HD MA 2.0 surround track and English subtitles. With thoughtful design work and solid range, the mix does a great job of complementing the disc's beautiful images. Dialogue is clear, well prioritized, and correctly centralized throughout with no balance issues to report. Delicate atmospherics like rain and rustling wind are spread throughout the soundstage well with subtly immersive surround use. Likewise, key effects, like a jingling bell tied to a character's footsteps, are emphasized nicely. The track also livens up quite a bit with surprising range during more aggressive moments, including a fiery eruption and a dangerous avalanche, which both offer solid LFE. Finally, the film's score comes through with nice separation and fidelity, transitioning from gentle flute melodies to classical pieces and a joyfully bombastic funeral procession during the film's climax. While not as enveloping as full-fledged contemporary surround sound mixes, this is a strong track that expands upon the movie's sumptuous visuals nicely. Criterion has put together an exceptional collection of supplements, including a commentary and a comprehensive documentary. All of the special features are presented in 1080p with Dolby Digital audio and English subtitles for the foreign language portions (unless noted otherwise). Commentary – Recorded in 2016, this track features film scholar Stephen Prince. Prince offers a solid discussion on the film, tracing the movie's origins, ties to Steven Spielberg and George Lucas, narrative approach, visual aesthetics, editing style, inspirations, personal connections to the director, and themes. Making of "Dreams" (HD, 150 min) – Presented in 1080i, this is a behind-the scenes documentary shot by Nobuhiko Obayashi during the movie's production. The doc is filled with interesting fly-on-the-wall footage from the set and numerous interviews with the cast and crew, offering an intimate peek at rehearsals, set dressing, makeup, effects work, and storyboard sketches for the movie's various vignettes. Longer than the feature itself, this is a fantastic inclusion, especially for big fans of the director. Kurosawa's Way (HD, 52 min) – Here we get a 2011 documentary directed by Catherine Cadou about Kurosawa's impact on filmmaking. 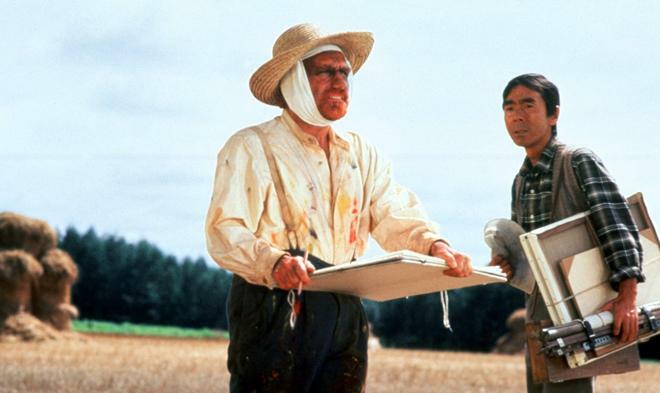 The doc features eleven directors -- including Julie Taymor, Alejandro González Iñárritu, John Woo, Hayao Miyazaki, Martin Scorsese, and Clint Eastwood -- all discussing Kurosawa's influence on their work and careers. Teruyo Nogami (HD, 17 min) – This is a 2016 interview with Kurosawa's longtime script supervisor. Nogami elaborates on his working relationship with the director and difficulties faced during the shoot. Takashi Koizumi (HD, 16 min) – This 2016 interview features Kurosawa's assistant director for his last five films. Koizumi discusses the impetus for 'Dreams,' the movie's inspirations, and what a typical shooting day was like. Trailer (HD, 2 min) – The film's trailer is included in 1080p with Dolby Digital 2.0 sound. 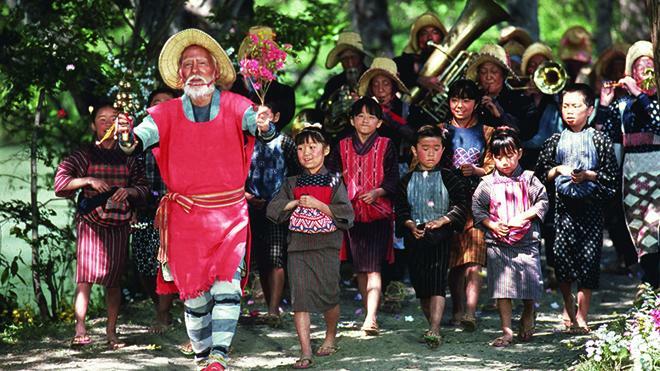 'Akira Kurosawa's Dreams' offers a visually stunning journey into joyous fantasy and haunting nightmare. Though the storytelling is very simple, the images are striking and the emotions and themes tied to each vignette are affecting. From a technical perspective, this disc offers a stellar video transfer and a great audio mix. Likewise, Criterion has included a fantastic and comprehensive collection of supplements, including a behind-the-scenes documentary that is actually longer than the main feature. This is a strong release for a wonderful film. Highly recommended.